"You look tired" he said as I reached my car that morning. Shaking his head he rephrased himself, "Do you think you look tired?" I shrugged at the stranger, and looked up at the grey morning sky. Winter was creeping in and everywhere was damp from the recent rain. "Everyone is tired at this time of year." "Is this your car? I cleaned it for you." I looked at him, this stranger who had halted me. "The birds, you know. I have a woollen sock. It works well, wool. It just wipes off, like this. See?" I looked at him as he wiped at my car with a white woollen sock. "I'm going to clean my steps using it next." I muttered my thanks and excused myself. Interesting kindness and odd words. The Brighton Farm organised Hackday at the Brighthelm Centre was a wonderful chance for the coding dojo group to get together to work on something different and fun. We reserved six places for the dojo regulars and arrived with no idea what the group would be working on for the day. Given the project-focus of the Hackday it wasn't run as a normal dojo session, we left the Randori behind in exchange for pair-development, stand-ups and iterations. Using the 5 minutes before we started to get an idea for the resources available we came up with the idea for generating a real-world interactive game using Inform 7 and the many different sensors that had been brought by Thom Hopper. Tristan (from whom I stole the photo) has described the result as a "crazy Heath Robinson unholy mashup. A text-based adventure game was enhanced to allow real-world interaction, such as pouring hot coffee on a temperature-sensing chip, or scanning cards embedded with RFID tags. Extremely inventive and successfully delivered on time - a testament to Scrum and the the agile programming techniques that they used." Tom describes it as "one of the most obscure combinations of technology I've ever been involved with: a text adventure game written for the day hooked up to a web server, a temperator sensor and RFID reader. Somehow we managed to balance a plot on top of all this and got the various bits of tech (Inform 7, web server, SFTP server, Java Robot classes, RFID reader, USB temperature sensor, a load of custom Java serial code and probably some other bits I've forgotten about) working towards a more-or-less-coherent goal... all run over 3-4 hours, obviously in an Agile fashion :)"
Jez gives a very detailed account of the day. He summarises: "The eventual demo worked a treat. 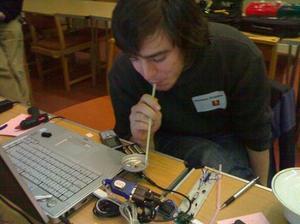 Thom had adapted the temperature sensor at the last minute to be embedded in the bottom of a cut off Coke can. Hot or cold liquid could be poured into this and be in direct contact with the sensor. This would post a message to a web server which the demo laptop was polling. The java Robot API was then used to write the appropriate command into the Inform game window at the prompt." He rather interestingly comments on the two different focuses for the game-play development: "I was focussed on producing a single simplest interaction to prove that the system would work, whereas Simon was interested in the story as a whole (i.e. start with the solution and work backwards)." The narrative game-play vs technical implementation should have been split into separate development groups sooner, but this dynamic for is an interesting issue for iterative text-adventure game development. For my part, although starting with helping out with the game development, I ended up finding myself pulled into the facilitator role. I'm not sure whether this helped the group retain focus, avoid obstacles, and coordinate - but I would like to think I wasn't just loitering around as this beautiful piece of madness was developed. My sponsored fortune cookie said: "However beautiful the strategy, you should occasionally look at the results" (Winston Churchill). The result was crazy, but certainly did work! InfoQ: How Long Should Retrospectives Last? Impressively still going since the early 1980's, what really astounded me seeing New Model Army play again recently was that they remain one of the best live bands I know. Made my heart oddly happy. I had the sheer pleasure of giving a SkillSwap talk on agile with Tom entitled 'Agile: Iterating the Reasons' on 21st November. As it occurred the day after XPDay, although shattered, there were a lot of arguments fresh in our heads. I did the dry conceptual basics and Tom countered with the enthused practicalities. It was the first time I had ever co-presented and it turned out to be a complete joy, together we could look at a subject from more than one angle and bounce ideas off each other. I think it also gave a nicer pace. I'd be curious to see whether much study has been done on co-presenting for teaching - I think there may be a strong parallel to pair programming. Quality was improved, interest (at least on our side!) was maintained, and - as this type of presenting is much less draining - may be more efficient. Teaching is exhausting, but much less so under these conditions. Theoretically it may be possible to teach more classes under this model where the work is shared. I loved doing this, and just hope that the people attending gained something from it as well. Our slides are available on request. This year I helped out with the organisation of XPDay - I had hoped to talk myself into a student volunteer role, but sadly ended up doing some actual work in advance (poster chair and working on various tasks such as conference feedback, student volunteers, t-shirts, flyers etc.). I helped Karl Scotland re-run the coding dojo session that I designed for the Brighton Festival Dojo. It was interesting to return to this with a group of professional programmers rather than a mixed skill group. I also got to attend a number of fun talks and workshops. I think XPDay was a success all in all, despite the split across two venues. The feedback gathered was positive, and I had a great time.